GRAMPIAN HOSPITALS ART TRUST are looking for submissions for exhibitions and/or projects for the Small Gallery at Aberdeen Royal Infirmary. The Art Gallery measures approximately 13 x 7 metres, providing approximately 13 linear metres of wall space. A staircase leads down into the area from the Main Entrance Concourse towards the West. The Main Corridor leads off the area to the east. The light source is mostly artificial with fluorescent ceiling fittings and halogen lamps. Some natural light falls from the glazed concourse wall above. 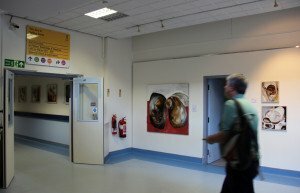 GHAT reserves the right not to show any artwork which is deemed unsuitable for exhibition in the hospital environment without further reference to the artist(s). The exhibitor is responsible for transport to and from the venue. A GHAT representative will be available to advise and help with hanging. All work to be installed on the walls of the ARI gallery use mirror plates. Please advise if you are unable to provide these. The GHAT insurance policy will cover artworks on display, though there is an excess of £250, which would be met equally by GHAT and the exhibitor, unless responsibility could be clearly demonstrated. The Art Gallery is covered by security video cameras but is accessible 24 hours per day so work needs to be well secured and relatively tamper proof. GHAT will produce the exhibition list and any other information to be displayed in the Art Gallery. The artist will supply a list of all works with titles and prices, an Artist’s Statement and a current CV. The artist will also supply an image to be used for the invitation, which will be required two months prior to the exhibition date, along with an appropriate title for the exhibition. GHAT will issue a Press Release and information for listings in local and national papers. Other ads can be placed by arrangement with GHAT. GHAT will cover costs of printing posters, flyers and all mail outs. A standard rate of commission is charged at 33.3% of the gross selling price. Artists will receive a statement of sales as soon as all works sold have been paid for, payment will be made to the artist within 30 days of the exhibition being taken down. GHAT is not registered for VAT.